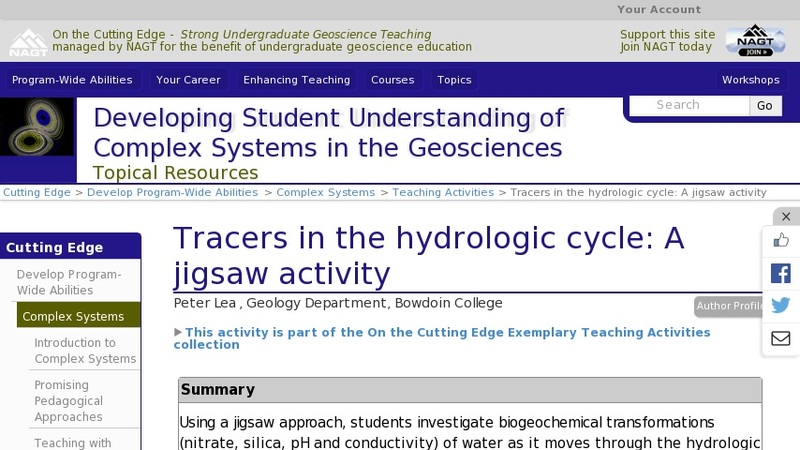 Using a jigsaw approach, students investigate biogeochemical transformations of water as it moves through the hydrologic cycle. In the first phase, student groups are given a schematic representation of the hydrologic cycle with representative concentrations of a single variable (nitrate, silica, pH and conductivity) provided for oceans, precipitation, streams, and shallow and deep groundwater. After each group has achieved a satisfactory explanation of its own variable, students are recombined to explain and compare the processes that control each variable, and to look for common themes (e.g., weathering reactions in subsurface increase conductivity, silica and pH). The resulting conceptual framework facilitates use of water-quality variables as tracers to interpret runoff processes and stream-flow sources.